She will be all smiles during the day, sleeping more during the night and because she has limited mobility she will stay where you put her; keeping her out of mischief – enjoy this while it lasts. Your baby has become quite a chatterbox by now and will be keen to practice her vocal chords and cooing conversation with you. The more time you interact with your little one, the better her skills will develop so sing, coo and laugh along; you’ll have mastered all those long forgotten nursery rhymes before you know it. By month four, your baby’s weight will likely have doubled from birth. If you’re concerned that your child isn’t eating well or isn’t gaining enough weight, talk to your pediatrician. Your baby is becoming more dexterous and doing more with her hands. Her hands now work together to move a toy or shake a rattle. In fact, those hands will grab for just about anything within reach, including a stuffed animal, your hair, and any colorful or shiny object hanging nearby. You might want to remove any earrings or necklaces if you don’t want to experience a painful tug. 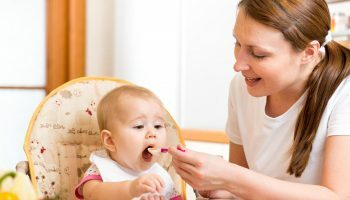 Anything your baby is able to pick up will likely end up in her mouth — tasting is one of the ways she explores her world. It’s crucial that you don’t leave small items lying around that baby could choke on. Anything that can fit inside a toilet paper tube is too small to be within finger’s reach of your 4-month-old. By now, your baby’s head should no longer be wobbly. 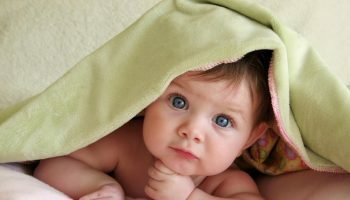 Four-month-olds have pretty good head control while sitting supported, and they can hold their head and chest upright while lying on their stomach during tummy time. They also can kick and push with their feet. Some babies have even figured out how to roll from tummy to back at this point. Your baby can get their first teeth any time from three months to one year old, but they may start gnawing their fist and frantically rubbing their gums about now in preparation for the trials and tribulations to come. If they get red patches on their gums and are dribbling a lot you’ll know the first tooth (usually a bottom front one) is probably on its way. In the first few months you’ll have been feeding more regularly than they are by month four. This is because your baby’s stomach is now bigger than before, meaning they can take on more milk during each sitting. Weaning is an exciting and fun development stage which should start when your baby is around 6 months old. 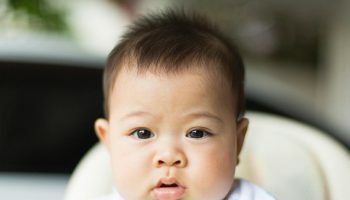 At 4 months it’s a good time to start preparing for this development and thinking about the best weaning techniques for you and your baby. Think about which foods you will introduce to your baby first and if you’d like to try out spoon-led weaning or baby-led weaning. Your baby might be able to manipulate bigger and heavier toys by the end of this month. “There’s a lot more engagement of their arms and hands, so provide toys that have different textures, different sizes, toys that invite discovery,” Eshelman advises. 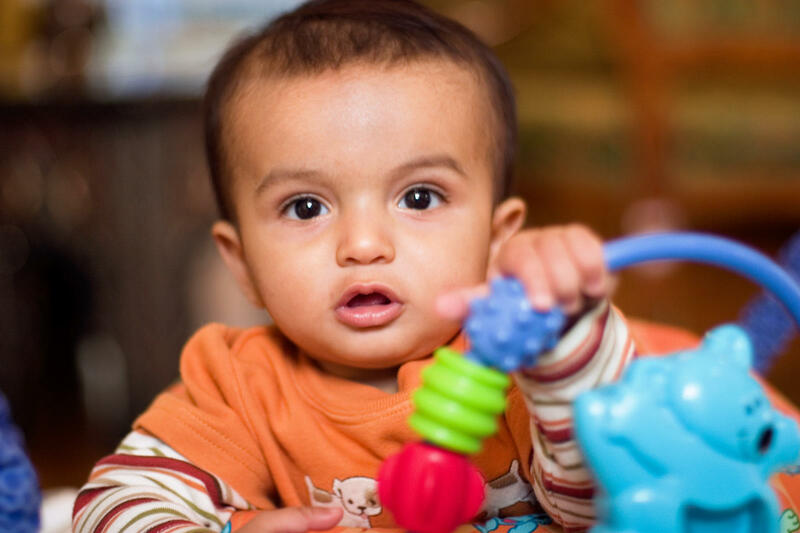 Soft books and toys that make sounds when manipulated can reward a baby’s curiosity. If a baby isn’t reaching for objects by the end of the fourth month, it could indicate a problem with vision or motor development, Dr. Wible says. As always, check with your pediatrician about any concerns that you may have.